Home / Android / rant / Tech / LG... Seriously? Violence might void your warranty with LG?? It is becoming a very popular opinion that LG is possibly the worst Android manufacturer around. This is a sentiment I regrettably share as I've waited for my buggy G-Slate to see some sort of update and/or bug fix since the day I bought it. Even more recently released tablets like the Transformer are already seeing the 3.2 update, but that's not what this post is about. "OK this is kind of a tricky method but it Will work 100% First call LG for being such dicks...atleast twice a day for a month. 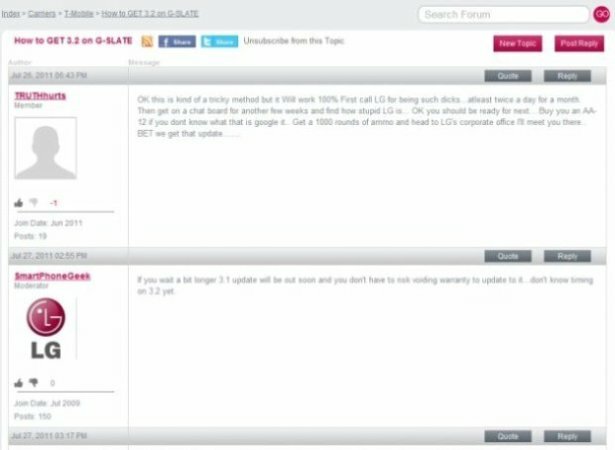 Then get on a chat board for another few weeks and find how stupid LG is... OK you should be ready for next....Buy you an AA-12 if you dont know what that is google it.. Get a 1000 rounds of ammo and head to LG's corporate office I'll meet you there.. BET we get that update......."
"If you wait a bit longer 3.1 update will be out soon and you don't have to risk voiding warranty to update to it...don't know timing on 3.2 yet." ... yep, that's right kids, illegal and hostile action towards LG could 'risk voiding your warranty'. ARE YOU FREAKING KIDDING ME? Did you even read the part where he threatened to come up to LG with a gun?!?! Seriously LG, seriously? No wonder you can't hear user feedback, you're not even reading it.